Have you ever heard about Ignition Bars? But do you use that trading setup to make money from your trades? 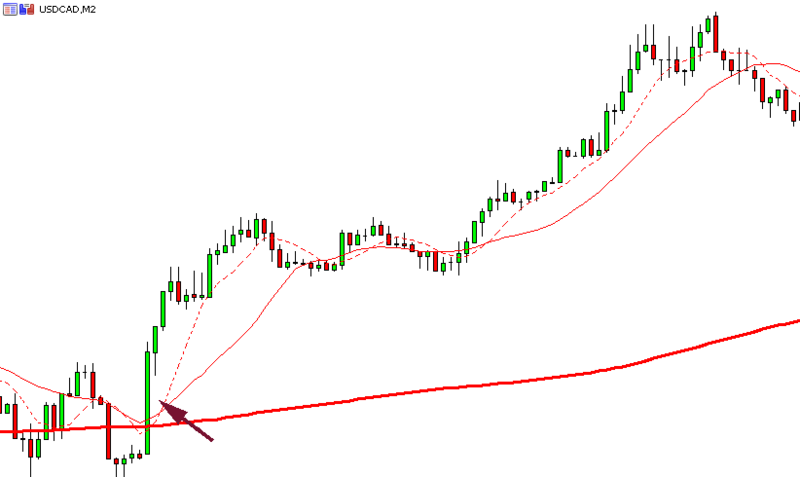 That’s a very simple but powerful trading pattern if used the right way. You should never miss a trading opportunity based on an Ignition Bar. Let’s take a deeper look and let me show you what I know. What is exactly an Ignition Bar? We can say that an Ignition Bar is the moment (or candle) where a lot of trends begin. Yes, you read right, a lot of trends, especially the most powerful ones, begin with an Ignition Bar. Imagine that you had the power to detect Ignition Bars on a chart. How many trends could you catch from the early beginning and ride until the end? You can make a lot of money just out of this simple trading setup. And the good news is, we can identify that on the charts! And even better, it’s very simple to detect them which makes them a good starting point to everyone that wants to know how to invest in stocks or forex. What should I see on a chart to detect an Ignition Bar? Ignition candles are big bars, much bigger than all the previous candles that you see on your chart. And because they are big, they are powerful and should get special attention from you. An Ignition Bar should be solid, with no wicks, especially at the closing side. It can, however, have a wick on the open side, but the more solid the better. Check this example with a Bull Ignition Bar. Can you see how obvious the candle is? How big it is compared to the previous candles? I see other big candles on the charts. How can I distinguish them from Ignition Bars? You can definitely spot other big bars on the chart with the same shape of an Ignition Bar. But the shape is only one characteristic of Ignition Bars, there’s another important factor to analyze: location. You see, big solid candles are Ignition Bars only if they appear on the right location. Now you’re thinking what should the right location be. Ignition Bars mark the beginning of a new trend. at the end of a sideways market. On this last case, they also mark the end of a trend. Also, they are the first bar of its kind on the most recent history. Look at this example: This is an Ignition Bar starting from a sideways market. Big fat bar, no wicks, much bigger than all the previous bars. It marks the break of the sideways market. It delivers a lot of power to break that resistance or support. And the market just follows the lead of that fat bar. It’s a perfect opportunity to trade. You can see that you have other fat candles following the Ignition Bar, but they are not igniting anything. We can consider them as just a continuation of the Ignition Bar. The Ignition Bar must be the first of it’s kind. Besides that start location, we may also eventually find more Ignition Bars after pullbacks. So, if you find big fat bars after a pullback, keep following them. They are delivering strength to your movement. And now this other example. This is an Ignition Bar at the end of a trend. The Ignition Bar marks the end of the previous trend and the start of a new one in the opposite direction. Big fat bar, no wicks (or very small), especially on the close side of the candle. The first bar of it’s kind. 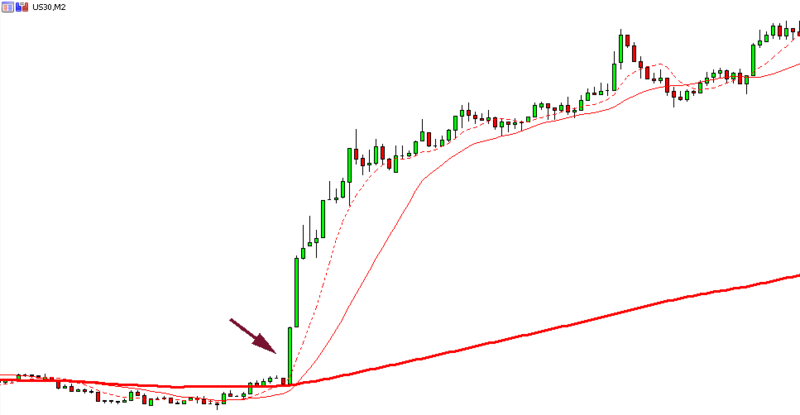 Ignore fat bars in the same direction, except when they appear after a pullback. That ones are telling you that the force is still with the trend. When do these patterns appear on the charts? The Ignition Bars may appear at any time on the trading charts but they are usually associated with moments of high volatility. For example, when there are news releases, there are a lot of traders jumping into the market and trading at the same time. That often creates great Ignition Bars, and they are a great place to start trading and riding a trend. I always advise the students from our trading school to check regularly Forex Factory Calendar to know when important news releases will happen. You can find great trading setups at that time. Look at this example of an Ignition Bar that appeared when CAD news was released. How amazing is it the way the price followed the Ignition Bar! Just check all your trading charts, from your favorite forex currency pairs or stocks. You’ll find lots of examples that show you what are the best stocks to buy. Another example of high volatility moments is at the open of the markets. At the open of the markets, ignition candles usually appear if you trade stocks or indices. Look at DAX at London open time. Great ignition bar right? And this one on Dow Jones at New York open time. 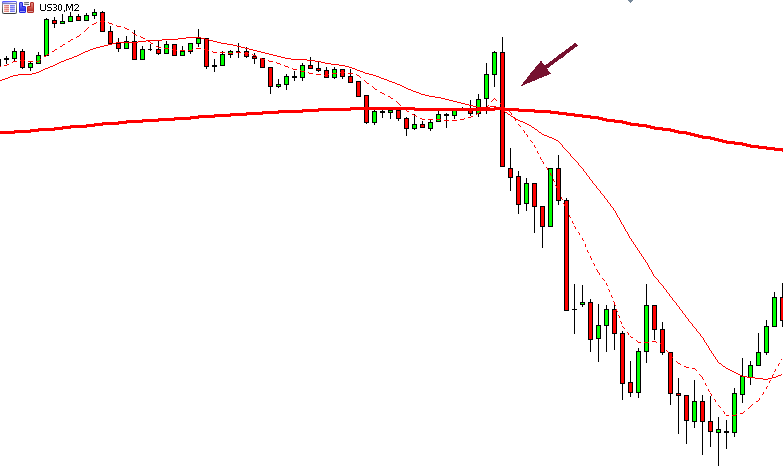 Those are examples of great timing to find intra-day setups to trade using Ignition Bars. On what time frame should I search for Ignition Bars? Short answer: any time frame! If you day trade or scalp, you can search them on your M2 or M5 or M15 time frames, or whatever time frame you use to day trade. If you swing trade you can search for them on H1, H4, Daily, Weekly, Monthly time frames. How should I trade Ignition Bars? 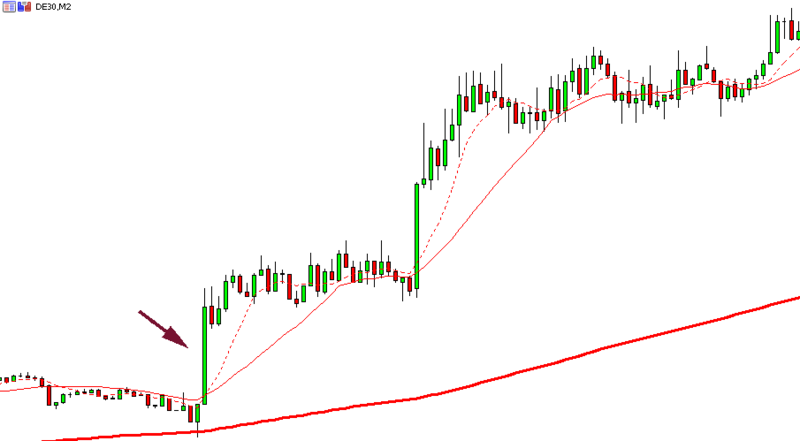 On our trading school, we teach our students and use our powerfull trading strategies to trade this kind of candles. But you can actually trade it using any strategy that you want. When you see an Ignition Bar just follow that direction. 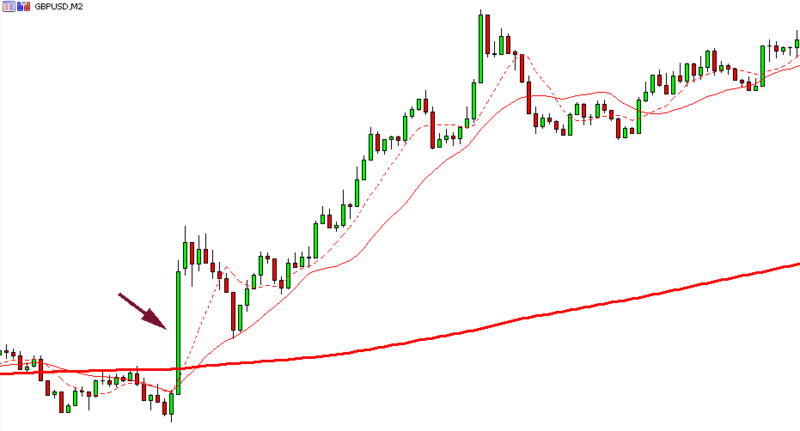 Ignore setups in the opposite direction and follow the main trend. You’ll improve your performance a lot with this simple trading setup. One powerful way to use it is to detect Ignition Bars on higher time frames, and then take trades only on that direction based on your strategy setups from lower time frames. It’s not the scope of this trading school article to teach you a complete trading strategy. There’s not enough space for that. But you now have a powerful way to detect the beginning of a trend, sometimes associated with the end of an opposite one. Use it on your favor and make money like the pros!! !